Hey, it is my first blog of 2014. It’s only taken 57 days to think of something to write about. Actually that isn’t 100% true – I have tried several times to write things and then abandoned them out of laziness or in the case of gig reviews, out of realising I spent too much time dancing and singing and not thinking of anecdotes for a review. Much like I usually do on this blog, I will be writing about music but more specifically, music festivals in the UK. I have only written once about both of the two major rock festivals in the UK, Download and Sonisphere and so will write about them both. I told myself that if I was attending either of these two festivals, it would be for a day only. Well, that may have changed. Instead of writing one crazy long blog, I’m going to write one about each festival. This one is about Sonisphere. 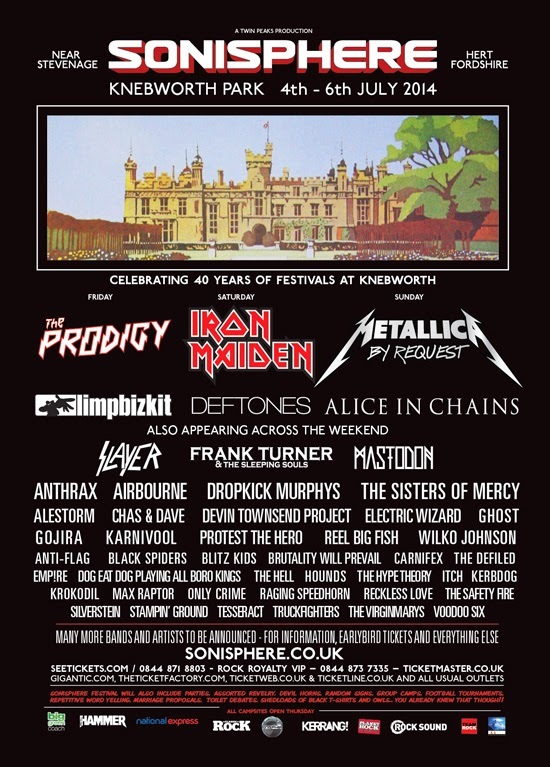 Last time I wrote about Sonisphere, two bands had been confirmed – Iron Maiden and Metallica. I somewhat ignored the announcement of Iron Maiden and discussed the gimmick for this Metallica tour – Metallica By Request. This wasn’t intended to slight Iron Maiden in any way, I just had very little to say about the announcement of Iron Maiden other than it was ace. I stand by that statement, it is an ace announcement. The final headliner was announced not long after those two and it was The Prodigy. Now, I can’t say that sold me too much but hell, the last time I saw them was at Download 2012 and I was cold, wet and in pain – not the best combination to enjoy a band at a festival! Since then, they have announced another 45 bands including the 3 main stage sub-headliners. Well, at least I assume that is what they are. Those bands are Limp Bizkit, Deftones and Alice In Chains. Limp Bizkit I recently saw on the Kerrang tour and are ace live. Deftones are a band who I have seen twice and who have bored me twice. Alice In Chains were a band I struggled to get into until just before seeing them at Download 2013 and they blew me away. The next 3 main acts are Slayer, Frank Turner & The Sleeping Souls and Mastodon. Slayer are a decent band but they do seem to play Knebworth a lot. 2014 will be the 4th Sonisphere at Knebworth and Slayer will have been at 3 of them. Frank Turner is an inspired booking – I saw him on his UK tour and thought he was just fantastic. Mastodon, aside from one song, does nothing for me. The top of the line up is not bad, but it does very little to sell me a weekend ticket (as much as I’d like to see Metallica and Frank Turner again, they are on separate days so a weekend ticket would be necessary). Without doing any research into the rest of the bands that are playing, from the rest of the line up, there is a further 10 bands that I actively would want to see live. Of those 10, I have already seen 7 live before (including one fairly recently). That isn’t the best of results as far as I’m concerned. The line up is then split into two sections (I’d suggest this is to separate main stage bands from smaller stage bands but I have no idea). In this first section is Anthrax, Airbourne, Dropkick Murphys, The Sisters of Mercy, Alestorm, Chas & Dave, Devin Townsend Project (DTP), Electric Wizard, Ghost, Gojira, Karnivool, Protest The Hero, Reel Big Fish and Wilko Johnson. First things first, I know they are celebrating 40 years of festivals at Knebworth with this festival but Chas & Dave?! That is a booking that is a bit different. Secondly, I am surprised to see Wilko Johnson announced. In 2013 he announced he had terminal cancer and was doing a farewell tour. Some of the dates have been cancelled due to ill health but some more have been added. If the man is well enough to perform then that is ace, but I still find myself surprised that this booking occurred. Looking at the remainder of those bands, I don’t know anything about Sisters of Mercy (other than Eureka Machines vocalist/guitarist Chris Catalyst is in the band). I like Anthrax, Airbourne, Dropkick Murphys, Alestorm, DTP, Ghost, Gojira and Reel Big Fish. I thought Karnivool were okay at Download when I saw them there. I don’t know anything about Protest The Hero and don’t really care for Electric Wizard. Overall for that portion of bands I would say I like most of them but there is little there which makes me want to buy a ticket for the weekend. I am starting to see a theme developing. The remainder of the line up consists mostly of bands I’ve not heard of, or maybe listened to once or twice. The main name from the remaining bands I like is Black Spiders, who I’ve not seen since 2012. The remaining bands are Anti-Flag, Black Spiders, Blitz Kids, Brutality Will Prevail, Carnifex, The Defiled, Empire, Dog Eat Dog, The Hell, Hounds, The Hype Theory, Itch, Kerbdog, Krokodil, Max Factor, Only Crime, Raging Speedhorn, Reckless Love, The Safety Fire, Silverstein, Stampin’ Ground, Tesseract, Truckfighters, The Virginmarys and Voodoo Six. There are some names there that are playing Camden Rocks festival in May (in Camden, surprisingly enough). Stampin’ Ground are reforming for this festival slot which is pretty cool. It is a similar situation with Raging Speedhorn. The problem after that is that I don’t know any of the other bands (or if I do it is not for good reasons). As it stands, that is the line up and I’d say it is probably about half to 2/3rds complete. There are a number of great acts on there but for me as a whole, it isn’t enough to sell me a weekend ticket. I’d love to go and see Metallica, Iron Maiden, Frank Turner Alice In Chains, Dropkick Murphys, Anthrax and Black Spiders again. The problem is aside from those acts, the rest that have been announced would be filling the gaps in my days, and as it stands, there are a lot of gaps in my days. I’m not saying Sonisphere has booked a weak line up though. The line up overall is really quite good. The reason I feel the way I do is that I like to go to gigs and festivals on a semi regular basis and therefore have seen the major acts Sonisphere has to offer before. Of course I’d like to see some again but when it is so many that I’m seeing again, I have to wonder whether it is worth the money. In this instance, I would say it is not. I will be intrigued to see what else they announce though.